Nothing like a beautiful Sunday to put me in the mood for stitching. The sunshine was glorious and a light breeze made the temperature lovely. I popped on the TV. Hey, it's football. Perfect background noise. The last day of sewing left me with the collar trim stitched onto the collar, the two pieces of the collar sewn together and the whole thing pinned onto the shirt. Today, I sewed the collar and the collar facing onto the shirt. 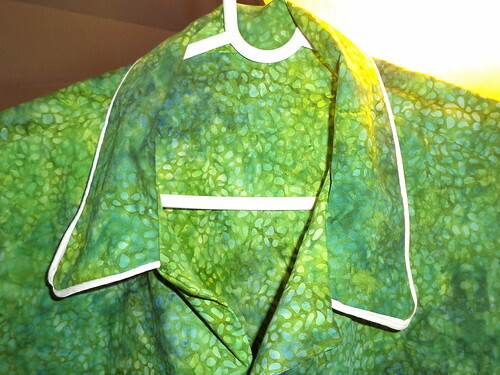 Once the collar and facing were hand sewn to the shoulder seams and the collar and facing have been pressed. The shirt instructions call for top stitching, but I'm not going to do that. I had considered topstitching in cream, but I prefer the cream piping. After getting the collar attached, it was time to attach the sleeves. I got them done and then it was time to move on to household chores. 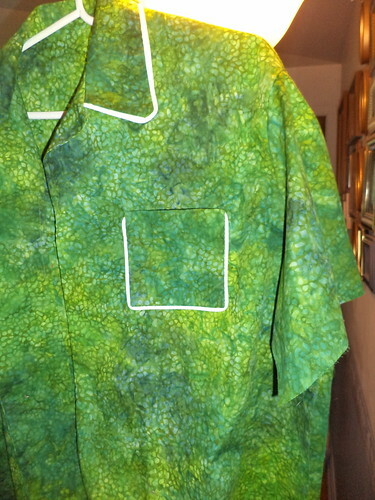 The next step is to sew the side seams, hem the sleeves and the bottom and do the buttonholes. This shirt is nearly done.